I’ve never missed the Condura Run since the time such road race was conceptualized by Patrick and Ton Concepcion and you can consider me as an avid fan and supporter of this run. Even if I was injured last November’s Pasig Marathon and sidelined for almost six weeks of no running workouts, Condura Run was scheduled as my first Marathon Run for the year. 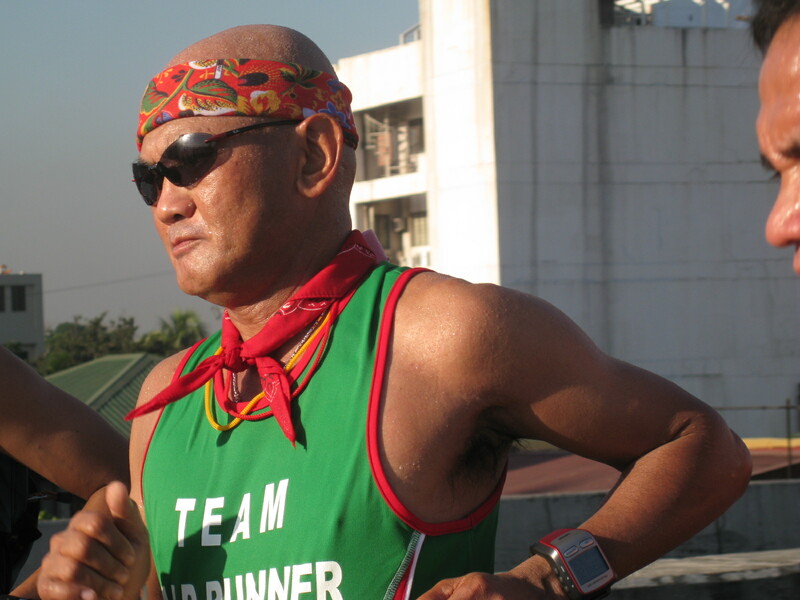 The Cebu City Half-Marathon last January 10 and the Midnight to Sunrise Run for the BDM 102 participants last January 31 were my “training runs” in preparation for the Condura Marathon. I set my mind that the objective of this run was to be able to finish it in less than 5 hours or better, in less than 4 hours & 30 minutes. 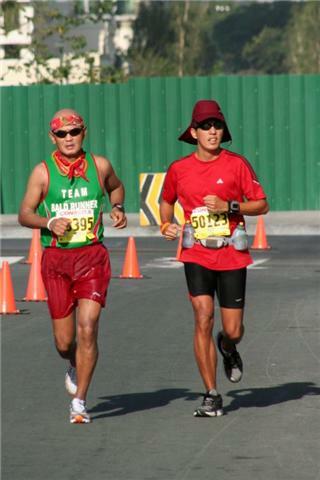 Condura Marathon is my preparatory run for my incoming “adventure run”. I checked-in at the coral area 20 minutes before 4:00 AM and I was able to meet the BDM 102 “veterans”; the “usual” faces in marathon races; Officers & Enlisted Personnel in the AFP; the “newbies”; and brothers Patrick and Ton Concepcion. Actually, it was my first time to meet Ton in person after so many exchanges of e-mails as I tried to impart some of my insights about the Condura run few months ago. I greeted most of the runners, smiled, and wish everybody good luck for the run. First thing that I admire in this race is the punctuality of the gun start! The race started at exactly 4:00 AM after a brief “fireworks”. My plan was to maintain a pace of 6:00 minutes per kilometer for the whole run and expected to finish the race in 4:15 hours. 1st Marathon For the Year! The second thing that I like in this race is the challenge of the race course. Everybody who finished the marathon would agree that the course is far more challenging than the race course of marathons outside the country. I think the Condura course is more challenging than the San Francisco Marathon! The course will always be in the minds and the “main topic” in the sharing of stories among the marathon finishers. 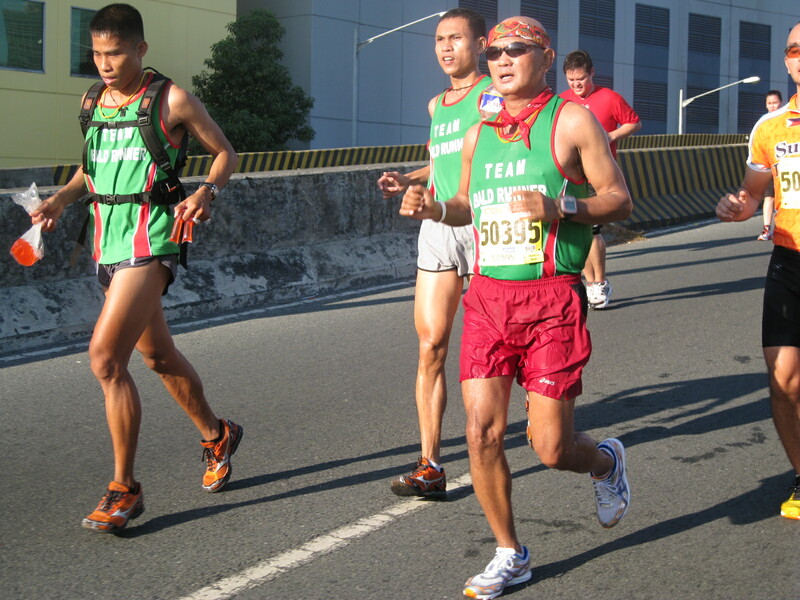 The uphill climb towards the Camp Villamor/NAIA 3 Exit of the Skyway was the “killer” in this course! The first time that I glanced my GF 305 is when I reached the 10K mark and I found out that my time was 1:02 hours. My 10K run was slower than what I’ve planned by 2 minutes but it did not bother me as I maintained my even pace. When I reached the 20K mark, my time was already 2:01+ hours and I was able to pick-up my pace. However, once I hit the turn-around at the Skyway, I made my pace faster and I was passing one runner from another. It was funny that whenever I join a runner or a group of runners, somebody always asked me what was my prevailing pace and I immediately told them that the pace was 5:45 minutes per kilometer (as what I saw on my watch)! But I became guilty of not telling them the accurate pace when I came to realize that after uploading the data from GF 305, my average pace on my way back at the Skyway was a blistering 5:05 minutes per kilometer! The third thing that I like in this race is the abundance of Water/Sports Drinks Station and long tables full of water cups. I am just happy that, slowly, the quality of races are getting better with regards to the basic support for the runners. I can consider the influence of the runner-bloggers as the main reason for this improvement. The Race Organizers and Sponsors are already “listening” and “reacting” to the basic needs of the paying runners! As for the Condura Run, they did a wonderful job on this matter. I hope they will remove those unnecessary guys who are handing those cups to the passing runners. It would be better to just simply leave those cups with water on the table and let the runners approach the table and grab their own water. With regards to Sports Drinks, I am a Gatorade-user and I am not used to Carbonated Sports Drinks during the run and so I was not able to drink the 100 Plus Sports Drinks offered at the Aid Station. At the 30K mark, my GF 305 registered a time of 3:00 hours flat and I was happy! No cramps, no issues, no pain, and no problem about my support. I stopped briefly to eat my instant oatmeal, fresh banana, and hard-boiled eggs as these will serve as my “fuel” for the last 12 kilometers of the run. 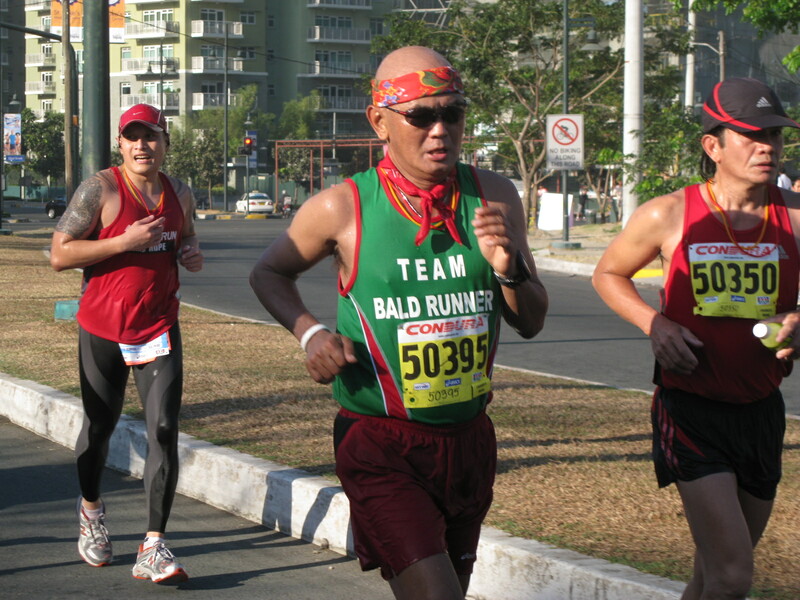 The last 10 kilometers was a long steady run pace with my Elite Team Bald Runner who finished their respective races. 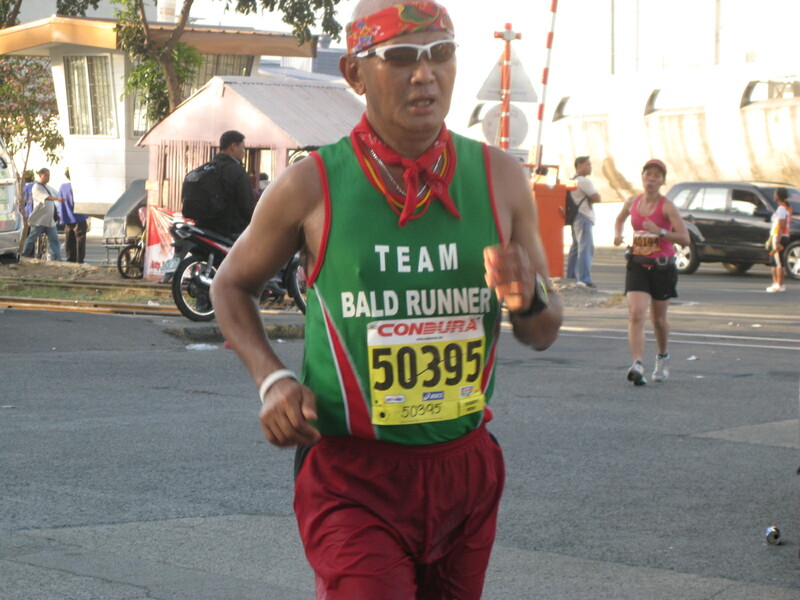 My Elite Team Bald Runner lone entry for the Marathon Race, Elmer Sabal, won 1st Runner-Up with a Cash Prize of P 40,000. Other members of the Elite Team; Alquin Bolivar won 1st Runner-Up, Alley Quisay won 2nd Runner-Up, and Crifrankreadel Indapan won the 3rd Runner-Up for the Half-Marathon; and Cora Salcedo won 2nd Runner-Up in the 5K Race, Women’s Category. My Elite Team had improved a lot since I transfered their “training camp” in the Sierra Madre Mountains. Due to the heat of the sun, I slowed down and there was no reason to speed up my pace on the last 5 kilometers. I have to preserve my body and not to exert a lot of effort on this part of the course. I need to recover quickly after this Marathon race and be able to prepare for my “adventure run” which I intend to start in the coming days. I finished the Condura Marathon in 4:17:12 hours (Official Time) with an average pace of 6:08 minutes per kilometer and average heart rate of 153 beats per minute. I finished #130 out of 593 finishers. 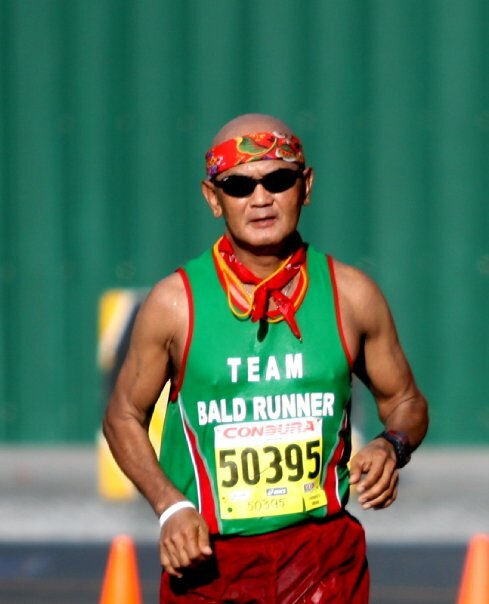 I ranked #11 for the runners 50+ years old. I was able to attain my objective for this race and ready to embark on my “adventure run”. To those who experienced their “first” marathon, congratulations for finishing the race, most especially to those who were trained under our running clinic and BR’s “speed training” at the ULTRA Oval Track. Our coaches, elite athletes, and staff are proud of your accomplishment. Lastly, my congratulations to Patrick & Ton Concepcion, Condura, sponsors and to all the volunteers for a great job! Sir Jovie, I am one of the proud products of your clinic and speed training and I thank you for your generosity in welcoming us. Because of you and coach Titus, I was able to conquer my first marathon with flying colors. Your dedication to running will never be forgotten. We will always see each other at the races. Nice meeting you yesterday, Sir Jovie! Godspeed on your adventure run. Can’t wait to read your updates! Congrats! And thank you for our medals, my group really appreciated it. Rest assured of our undying commitment in your every races in the near future. Thanks Sir for pulling me on the last stretch at Condura. You’ll always be a role model and inspiration. Good luck sa adventures. Cheers! sir jovie, i’d like to join the clinics and speed training at ultra. how do i join? is there a fee?